TASS-FACTBOX. The main annual international football tournament among national teams - the FIFA Confederations Cup - kicks off in Russia on June 17. The FIFA Confederations Cup is a tournament among national football teams held under the auspices of the Federation Internationale de Football Association (FIFA) in the country that will also host the World Cup in 2018. 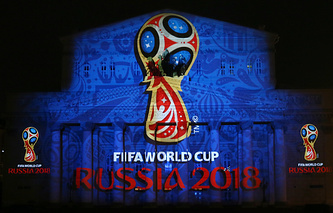 Russia won the right to host the 2018 FIFA World Cup and automatically became the host of the 2017 FIFA Confederations Cup as well. The 2017 Federations Cup organizing committee is chaired by Russia’s Deputy Prime Minister and President of the Russian Football Union Vitaly Mutko. National teams of Russia (the 2018 FIFA World Cup host), Germany (the winner of the 2014 FIFA World Cup), Portugal (the champion of the UEFA Euro 2016), Chile (the winner of the 2015 Copa America), Australia (the 2015 AFC Asian Cup winner; Football Federation Australia has been a member of the Asian Football Confederation since 2006), Mexico (the winner of the 2015 CONCACAF Gold Cup; in October 2015, Mexico defeated the US (the champion of the 2013 CONCACAF Gold Cup) in the play-off match for the right to represent CONCACAF in the 2017 FIFA Confederations Cup), New Zealand (the champion of the 2016 OFC Nations Cup) and Cameroon (the 2017 Africa Cup of Nations winner) will take part in the tournament. The current Confederations Cup holder, Brazil’s team, were knocked out of the 2015 Copa America in the quarter-finals and lost the opportunity to defend their title which they earned in 2013. The draw for the FIFA Confederations Cup 2017 took place in Kazan on November 26, 2016, the identity of the Africa Cup of Nations (held in February 2017) winner being unknown at the time. Group A, selected during the draw, features Russia, New Zealand, Portugal and Mexico, and Group B contains the 2017 African champions plus Chile, Australia and Germany. Four stadiums will host the Confederations Cup games: Spartak Stadium (located in Moscow; named "Otkritie Arena" in 2014, when it was opened, and renamed as "Spartak Stadium" for the time of the tournament), St Petersburg Stadium, Fisht Stadium and Kazan Arena. The tournament’s final will be held in St. Petersburg, whereas the third place play-off will be held in Moscow. On June 7, 2017, Russia’s coaching staff headed by Stanislav Cherchesov named an entirely home-based 23-man squad for the Confederations Cup: three goalkeepers (Igor Akinfeev, Vladimir Gabulov, Marinato Guilherme), six defenders (Roman Shishkin, Viktor Vasin, Georgy Dzhikia, Ilya Kutepov, Fedor Kudryashov, Ruslan Kambolov), ten midfielders (Igor Smolnikov, Yury Gazinsky, Denis Glushakov, Alexei Miranchuk, Alexander Golovin, Yury Zhirkov, Alexander Samedov, Alexander Yerokhin, Dmitry Tarasov, Dmitry Kombarov) and four forwards (Dmitry Poloz, Fedor Smolov, Alexander Bukharov and Maxim Kanunnikov). Russia will face New Zealand in the event-opening match on St Petersburg Stadium on June 17 and Portugal on Spartak Stadium on June 21. The match between Mexico and Russia will be played on Kazan Arena on June 24. The tournament’s Official Emblem was revealed on February 3, 2016. The shape of the tournament’s trophy inspired the design of the emblem, which is decorated with the Firebird, a magical bird in Russian folklore. On November 11, 2016, the Official Match Ball named "Krasava" was revealed. 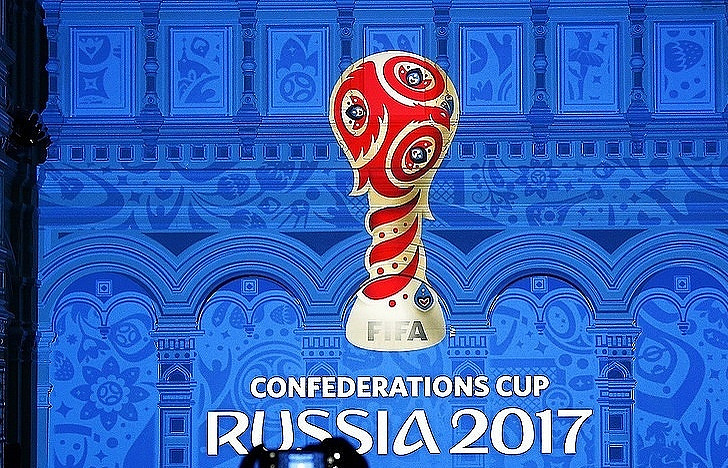 The Confederations Cup has no official mascot (the mascot for the 2018 World Cup is Zabivaka the wolf). A white cat named Achilles became the tournament’s mascot. It was chosen by St. Petersburg’s Tourism Development Committee, the Sports Day after Day publishing house and the State Hermitage Museum. Achilles will "predict" the results of the Confederations Cup matches. Ticket sales for the tournament began on November 8, 2016. After buying a tournament ticket, each football fan must obtain a fan identification document (Fan ID). Russia started issuing Fan IDs on February 1, 2017. A Fan ID provides access to the matches of the FIFA Confederations Cup Russia 2017 and a free travel pass. On May 1, 2017, Russian President Vladimir Putin signed an order to change the visa scheme. Foreign tournament participants are granted ordinary humanitarian visas for multiple entries, whereas individuals who help to prepare and organize the Confederations Cup are granted ordinary multiple-entry business visas or ordinary multiple-entry work visas. Under Russian law, foreign spectators can enter the country visa-free, with only identification documents and a Fan ID. This regime will operate 72 hours ahead of the Confederations Cup’s first match and will be lifted on the day of the tournament’s last match (from June 14 to July 2, 2017). During the tournament, FIFA plans to test the Hawk-Eye video assistant referee technology and a fourth substitution during extra time.